Those who swear by the cult NARS multi-purpose stick for eyes, cheeks, lips and body will love the NARS Multiple Tint £27. It is essentially an updated version of the multi-purpose stick but in summer hues with a more translucent tint. This is a fantastic no fuss product, perfect for those of you who often find yourselves slapping the make up on the train or in the car at the red lights. For an everyday look this product can be worn alone for flush cheeks or stained lips. For a stronger look it can be layered with other face and lip products and is particularly good on the the lips with some gloss worn over the top. 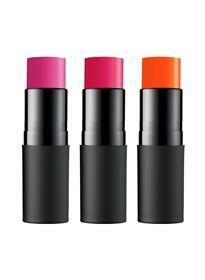 The Multiple Tint comes in three vibrant shades and the convenient tube makes it a handbag must have.